Valley & Ridge 2017: Interdisciplinary faculty study group for sustainability. In collaboration with the Association for Advancement of Sustainability in Higher Education (AASHE), Dickinson hosted the 2017 and 2018 Valley & Ridge Faculty Development Workshops and opened applications to undergraduate faculty from other colleges and universities to participate alongside the Dickinson faculty cohort. Faculty that were thinking about integrating social, economic and/or environmental sustainability into their undergraduate teaching were encouraged to apply, and 17-20 participants were accepted into the program. We have now worked with over 15 other institutions from througout the region and covered disciplines such as engineering, theatre and dance, economics, Italian, and chemistry. 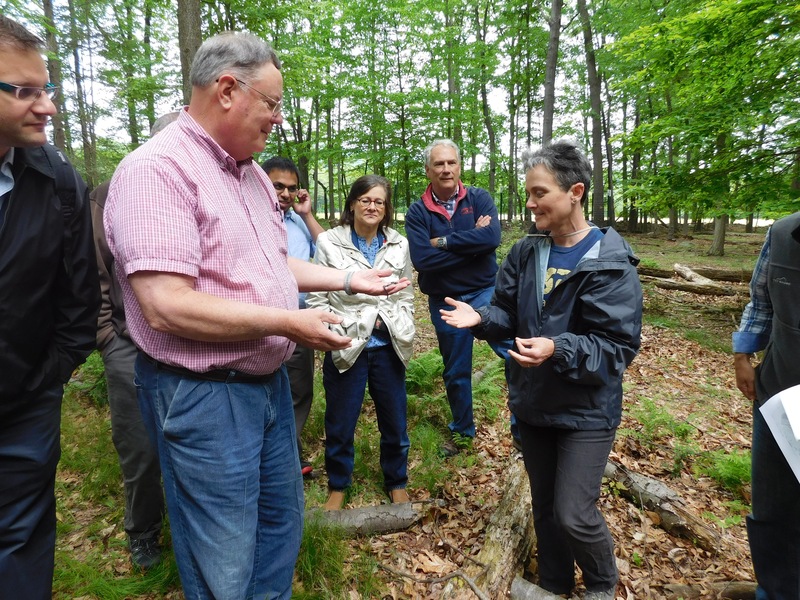 Valley & Ridge has annually brought together faculty members from all academic disciplines to work collaboratively to introduce and enhance sustainability content in new and existing courses across the curriculum. Sponsored by Dickinson’s Center for Sustainability Education, and now entering it's 11th year, this workshop has helped over 80 Dickinson faculty connect the subject areas of their teaching with sustainability using active learning pedagogies such as place-based & experiential education. The Valley and Ridge Project at Dickinson takes its name from the physiographic region within which the College lies, which is marked by the Allegheny Plateau to the north and west, South Mountain to the south and east, and Cumberland Valley in-between. The project got its impetus from Dickinson’s participation in the Shared Futures and Sustainability Initiatives of the American Association of Colleges and Universities (AAC&U). The Valley and Ridge Project is modeled after the Piedmont Project of Emory University and the Ponderosa Project of Northern Arizona University. Participants that complete the program are then classified as Valley & Ridge Fellows and can contribute to and benefit from a resource network with other fellows, participate in continuing education and experiential programs offered by CSE, and continue to advance sustainability within their discipline and across the curriculum. Share resources for developing and enhancing sustainability content in courses. We seek undergraduate faculty from any and all academic disciplines looking to incorporate sustainability into their teaching. Dickinson faculty and faculty from other insitutions are encouraged to apply for May 21-23, 2019 workshop. All food and transportation during the workshop is provided. Dickinson faculty receive a stipend, and may attend at no cost. Non-Dickinson participants must pay a workshop fee of $125. Participants must cover travel to and from Dickinson and lodging (if applicable). Contact sustainability@dickinson.edu or 717.245.1117 for more information.